You're Invited to our Summer Gatherings! Neither rain nor chill deterred locals from attending the Ojai Women’s Fund (OWF) presentation of FOCUS: Our Environment, at The Ojai Woman’s Club, Thursday, March 22nd to hear a panel of experts explain Ojai’s post-Thomas Fire status and explore major environmental concerns of the Ojai Valley. What is the biggest environmental myth in Ojai? White: That citrus spraying is necessary. Parker: That non-native, drought-tolerant plants are as good as native ones. Jones: That Ojai doesn’t have enough water. Kuyper: So many myths -- heed what science tells us. What role did fire play in Ojai’s ecology? How is the ash affecting our soil and water? What is the most effective way to protect homes from fire? Should debris flow concern us? What can we do? What are three things should we plant and three we should remove? What are your environmental priorities six months to three years from now? The Ojai Women’s Fund hosted Focus: Our Environment as part of its ongoing series of talks that brings together community experts with Ojai residents to explore pressing needs in the Valley, especially within OWF’s target areas: arts, education, environment, healthcare and social services. OWF’s representatives Therese Hartmann opened the program, Carey Appel served as moderator, and Lisa Casoni provided concluding remarks. OWF extends special thanks to caterer Christine Denney, Rainbow Bridge; sound technician James Antunez, A-Z Musical Services; and photographer Stephen Adams, for contributing their talents to the evening’s success. Join Us for Focus: Environment on March 22! The 2018 year begins with a few exciting changes for the Ojai Women’s Fund leadership. Co-chair and co-founder Peggy Russell stepped down from her position at the end of December and will continue to serve as Finance Chair. Anna Wagner has stepped up to co-chair the organization with Karen Evenden. Anna has been involved with the OWF steering committee as Volunteer Coordinator for one year. She is currently Director of Development at the Ojai Music Festival and lives in Ojai with her husband, Bill (Music Director at Nordhoff High School), their daughter Charlotte, and dog Charley. She will assume the role formerly held by Co-Chair and co-founder Peggy Russell, who will continue to serve as Finance Chair and Treasurer. Karen and Anna recently met to share a little bit about why they were involved in OWF, the growth they’ve seen in the organization, and their hopes for the upcoming year. KE: We’re starting 2018 coming off of another very successful year. Last year, we increased our membership and were able to grow both in numbers of women involved and in dollars raised, which in turn led to another incredible grant cycle. I think we all came together to join the OWF wanting to donate back into the community and I think that the dream of really understanding how much of an impact we can have is becoming real. I’m personally always so surprised to be reminded, having worked in larger cities, how $10,000 is able to make such a difference for our local agencies. You look at Santa Barbara, or Seattle (where I came from), their scale is more like $25,000 or $50,000. The needs are definitely here in our community, but the numbers needed to make an impact are smaller. Anna, what motivated you to agree to be co-chair? AW: Well, it’s hard to say no to Karen! (laughs) I feel like often when a new nonprofit comes up, there can be a feeling of competition rather than collaboration. There’s something about this organization and its underlying values of equity and fairness that really speak to me. I see it in memberships, in the way also that we do the grants – we really want to make sure that everyone has a chance in an equal manner to participate. What’s incredible about OWF is that for as little as $100 as a group member, or $1,000 for an individual membership, you have an opportunity to vote and make a difference in this valley. The idea that my $125 as a group member equates to $64,000 in giving is really meaningful and something to be proud of. I didn’t give that much, and yet I did because all of us decided we were going to collectively give. The education component of this organization also really appeals to me. I feel that to educate women on being philanthropic in general is an important concept that will help this organization, the valley, and other organizations as well. I really appreciate how some of our members may find that they voted for an organization that didn’t get money and decide they’re going to make a gift to support that program on their own because of what they’ve learned of the need in our community. KE: Let me say why I thought Anna was the perfect choice. It’s important to all of us that we have a broad and diverse membership base. To appeal to the next generation of women in this community, we need to be able to communicate to them, while at the same time balance the needs of our younger members with those of our older members. I can’t think of a better person than you…you bring the youth, the experience, the knowledge, and fun. AW: I really do admire the skill sets of the women that have come before me – you have the luxury of being retired and being able to volunteer the time, which is so important. While we [the younger generation and working women] may not have as much time to offer, we bring our own skill set that is equally important. I have made it a mission in this past year to be more present in the community in the way of volunteering the time I have. To be honest, I’ve bitten off more than I can chew! But that’s because if we don’t start it, who will continue this chain of giving back? I feel it’s important to lead by example and let people know that your time is needed. Even if it’s not a lot of hours, it’s something. Maybe if we can get more people in our generation to do one or two hours of their time a week it will lead to something greater down the road. KE: We’re looking to continue to increase the number of members and dollars we raise…we want to be able to increase the size of the grants we give out. Also, I think it will be important to focus more on recruiting and retaining our group members. I’m really looking forward to giving more recognition and training to the group leaders and to incorporate them more into the fabric of the organization. They really are the ambassadors for what it is we do. I also think it’s time to focus more on the program side of things rather than the agencies. Here in this valley we have a small number of agencies, but a large number of programs. We really need to look at what the core issues are in our community and how we can respond. And that’s why we’re going into this series of “FOCUS” events that will delve more significantly into understanding, at this point in time, what the issues are. AW: We’re small enough that we can be really flexible in the way we listen to the community and respond to that in addressing what the valley needs. In planning the FOCUS events, the Grants Committee really thought about how best to understand the greater needs of this community. It’s going to be really interesting to find out what comes out of each of those discussions because while what we may hear may not affect us in the current grant cycle, it will greatly influence how we work in the future. I’m also looking forward to sharing more the success of what the different organizations have been able to accomplish with the grants that they have received, to report back to our members what their dollars have done for our community. We’re small enough that we can have an impact and we can see that impact. And to know that we’re making a difference in our valley – to see it every day – is special. And that’s why we’re all here. KE: In just a few years, the OWF has just grown beyond my earliest expectations. It’s not just the dollars raised, it’s the enthusiasm of everyone and the buy-in to “Yes, we as women can make a difference”. We can all come together to make that difference – “the joy of local giving” is really exciting. 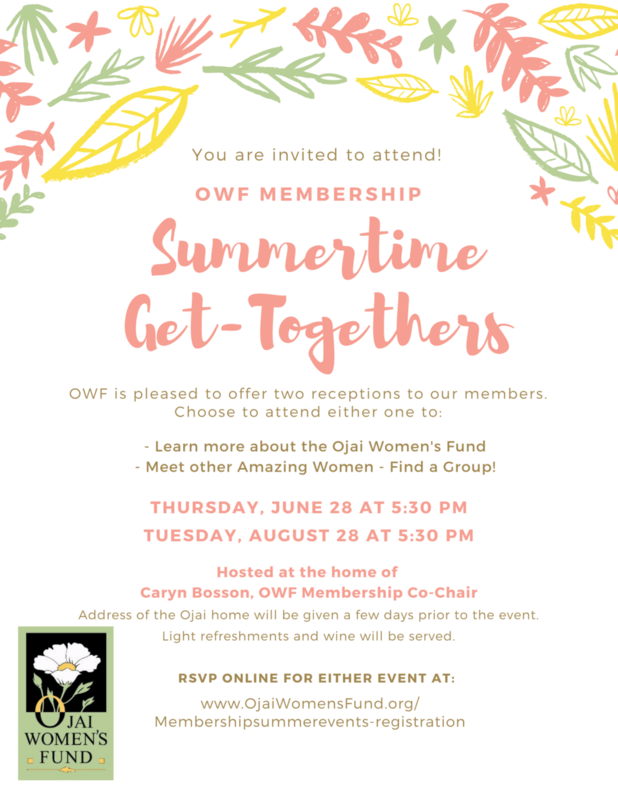 The Ojai Women’s Fund extends its deep gratitude to outgoing members of the Steering Committee Barbara Hirsch, Aryna Swope, and Sandi White for their dedication and many hours of work in running OWF. We welcome incoming Steering Committee members Caryn Bosson and Caitlin Praetorius, who join our continuing Steering Committee members Victoria Bortolussi, Kyle Crowner, Marquita Flemming, Donna Freiermuth, Margo Haas, Judy Norris, Peggy Russell, and Tiarzha Taylor. Life as we know it can change in a blink of an eye. We have all heard this, yet the residents of Santa Paula, Ventura and Ojai had no idea it could happen to such a magnitude and forever change our lives. Whether we lost something valuable to us or we are touched by others who have lost their homes, we are all feeling a sense of gratitude and thankfulness to our firefighters and first responders for saving our town of Ojai. We want to extend ourselves to be of assistance to those who are in need and for many of us, we do not have adequate information for the best resources. 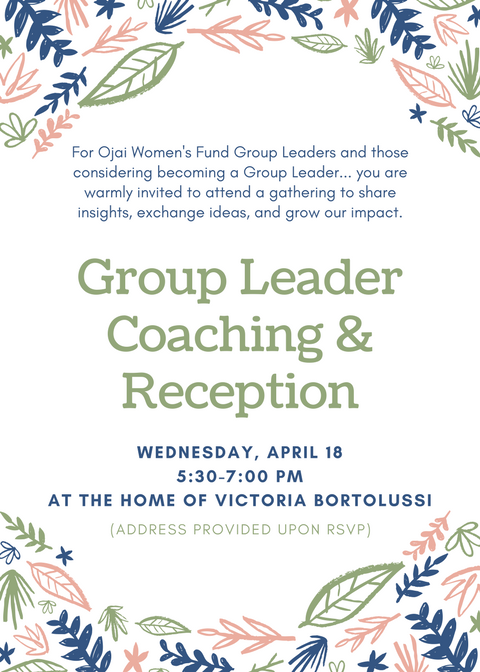 In this extraordinary time, the Ojai Women’s Fund is reaching out to its members to share information that we feel is helpful to you. 1. Join the Ojai Community Thomas Fire Network on Facebook to get connected with the latest news being shared and ways residents are helping one another. 2. Make a donation to Ojai residents affected directly by the fire by visiting helpofojai.org. 3. Visit ojairelief.com, a grassroots effort helping Ojai residents find resources and ways to help those in need. 4. Visit the Ojai Valley Community Hospital and pick up free masks to protect yourself and others from the smoke. 5. Shop and Eat Locally! Support our local businesses during this critical time. Friday Dec. 15, 10-11am: Purchase Ojai Strong Merchandise at Ojai Baby (203 N. Signal St). Proceeds to benefit Help of Ojai. Saturday, Dec. 23. 4-7pm: Night at the Bookstore Fundraiser for Thomas Fire Victims at Bart's Books (302 W. Matilija St). Click here for more information. The Ojai Women’s Fund is pleased to announce $64,000 in grants to eleven organizations in the Ojai Valley. These grants, awarded in five program areas, reflect the Ojai Women’s Fund commitment to making grants on an annual basis to organizations that target critical needs in the Ojai Valley. Save The Date - May 8! The saying “If you build it, they will come” certainly proved true in Ojai last week as the Ojai Women’s Fund 2017 Kickoff Event drew well over a hundred women to the Ojai Women’s Club on February 28th to hear celebrated Ojai resident Esther Wachtell talk about her passion for and longtime relationship with philanthropy. Wachtell is the founder and retired president of The Wachtell Group, a fundraising consulting company; and founding chair of the Center on Philanthropy and Public Policy at the University of Southern California. The psychological benefit of giving is obvious: it makes us feel good. But beyond the bliss bubble is a very tangible uplifting of self and community that feeds empathy, fosters compassion and understanding, and nurtures dignity and respect. “We see that it makes a difference. Our spirits are enriched every time by the simple act of giving,” says Wachtell. Locally, the Ojai Women’s Fund has done extensive research in an effort to best understand its community and community needs. Last year, the OWF awarded $60K in grants to local nonprofits serving arts, education, environment, health and social services needs in Ojai. This year, the OWF aims to do even more. If the enthusiastic turnout for Esther Wachtell’s talk at OWF’s 2017 Kickoff Event last week is any indication of Ojai’s passion to care for its community – it shall be a successful and rewarding year ahead for Ojai, indeed. The OWF is currently seeking applicants for 2017 grants in categories of Art, Education, Environment, Health and Social Services. Application period ends April 12. Grant applications and information are available by clicking here.